As every gardener knows too well, there is that time between when the spring-blooming flowers fade and the summertime perennials begin to emerge that sometimes gets overlooked. 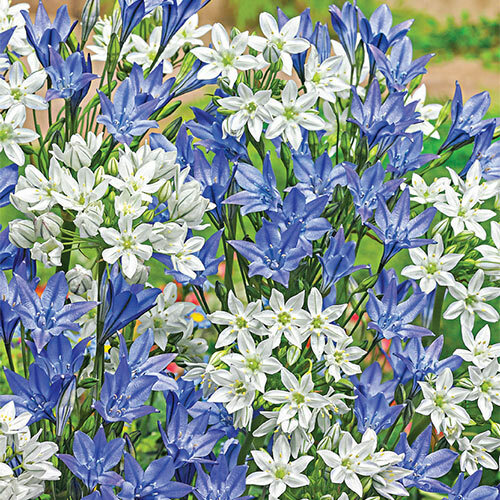 With our lovely, colorful Triteleia Mix, your customers can easily bridge the gap between spring bulbs and perennials with bright and beautiful blooms in two colors. Each June, up to 25 trumpet-shaped flowers of blue and white appear on each wiry stem, luring butterflies and other beneficial pollinators to sunlit mixed borders, seasonal beds and container gardens. Triteleia grows very quickly, naturalizes well and produces plenty of flowers for both indoor and outdoor enjoyment. Drought tolerant and easy to grow. Each flower consists of three petal-like tepels, six stamens and a 3-lobed stigma atop a single 3-chambered ovary. Narrow, linear, gray-green, grass-like basal leaves. Plant bulbs 3-5" deep and 2-4" apart. Rich, fertile, humusy, well-drained soils. Zone 5 plant in protected site and mulch in winter. Averag to low water needs. Best with regular and consistent moisture during the growing season (spring to early summer), but needs a dry soil during the post-bloom dormancy period.